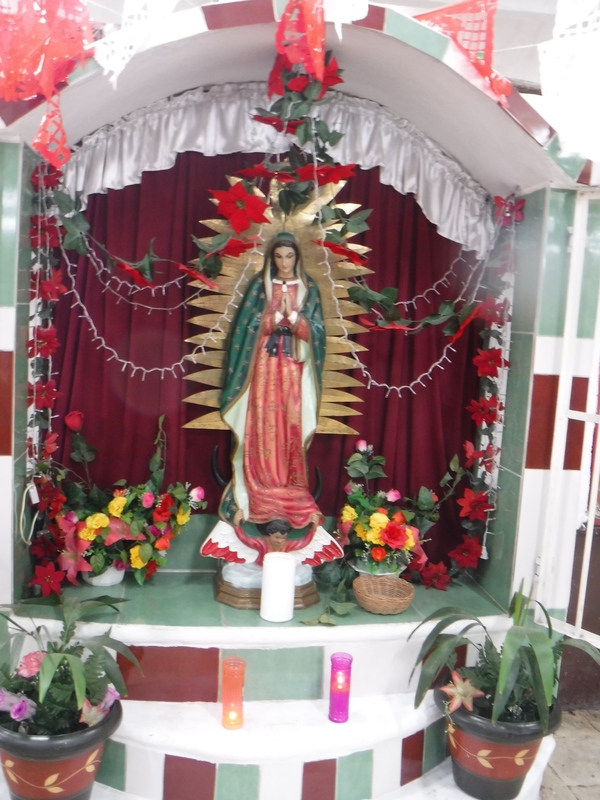 Virgin of Guadalupe in the public marketplace. I took a one day trip with friends to Valladolid recently. It is located in the middle of the Yucatan Peninsula, half way between Merida on the west and Playa del Carmen on the east. 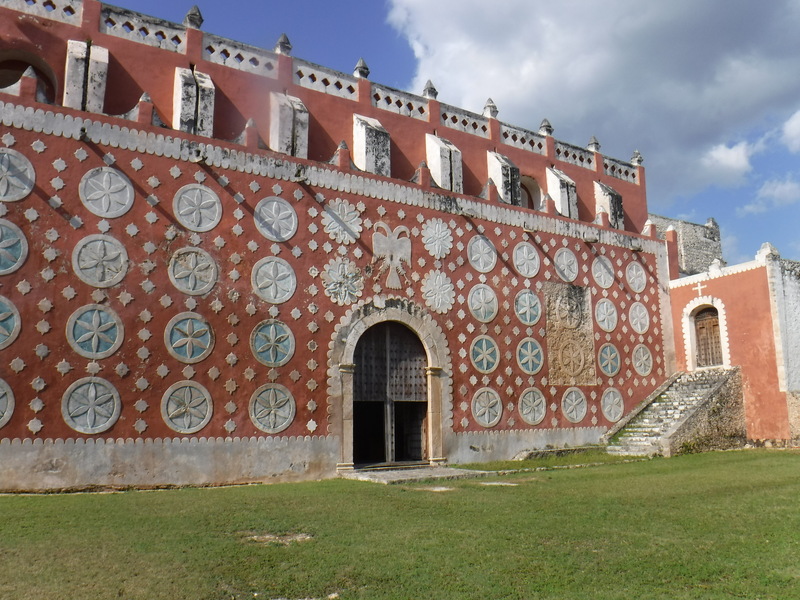 This was the country of huge haciendas producing the fiber from which ropes for shipping were made. The public markets in all these towns are attractions for me. 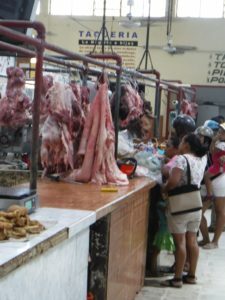 The size of this was quite manageable – some are blocks and blocks long – and the colors and odors were wonderful. And just down the street was a piñata making shop with newsprint underbodies drying in the sun out front with other finished pieces. 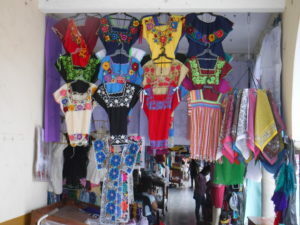 Bright colored blouses and dresses abound in the market. 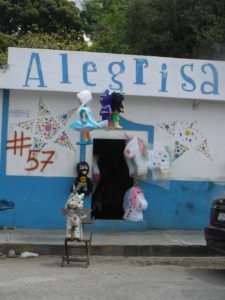 The piñata maker, Alegrisa means “Joy”. A walk through town with stops at Dante Bookstore for piles of children’s books at very reasonable prices and shops in the front rooms of houses: textiles, baskets, natural perfume and much more. 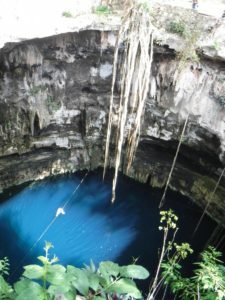 We met our van and followed a dirt road to Hacienda San Lorenzo Oxman for dip in an incredibly beautiful cenote. To enter the water one needs to walk down 9 sets of 10 stairs that have been carved from the limestone cliff surrounding it. The water is deep all around, a couple ropes to hang to and a rope swing that was used by young and old to splash into the cool, cool water. 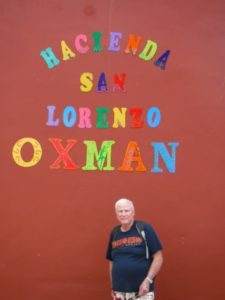 On to Hacienda Lorenzo Oxman. And the last stop was Uayma, a little town west of Valladolid with this amazing church. The newly installed government marker described the architecture and design as being influenced by Austria. So perhaps a hacienda owner missed the old country. Usually there is an active corn grinding business where the ladies bring a bucket of corn kernels to be ground and mixed with lard and walk home with a bucket of masa for making tortillas and tamales. But that day we arrived too late and missed this activity. And finally Uayma for this lovely church.